"I did warn you that leaks would have to be patched." A fantastic addition to a Weyland kill deck. If you are aiming to murder the runner, the bad pub if you fail to score it isn't going to be a huge problem for you. This and Scorched Earth will be enough to demolish almost any runner's hand. 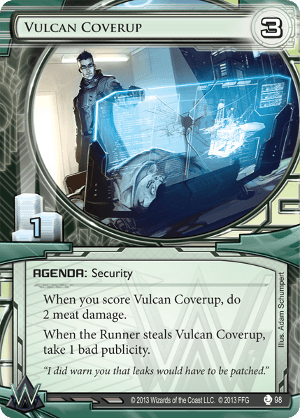 The card denial is nice for any Weyland deck, but the potential downsides aren't worth it for an advancement-focused deck.